A singer and songwriter whose literate, impressionistic storytelling and richly evocative melodies have made her one of the well-respected artists in the contemporary folk community, Patty Griffin is also a superb vocalist who sings of the human heart and soul with a passion that's palpable but never histrionic. Most comfortable working outside the major-label system, Griffin went from performing in Boston coffee houses to national acclaim with 1996's Living with Ghosts, a debut album drawn from her solo acoustic demo recordings. While she would explore more full-bodied arrangements on 1998's Flaming Red and 2002's 1000 Kisses, her work always expresses a powerful emotional intimacy, and she's touched on her spiritual concerns with the albums Impossible Dream (2004), Downtown Church (2010), and Servant of Love 2015). 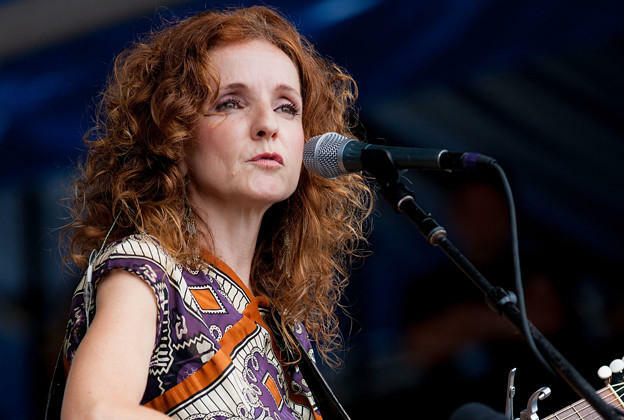 Patty Griffin was born in Old Town, Maine on March 16, 1964. The youngest of seven children, Griffin was 16 years old when she bought her first guitar for $50. While she learned to play, she showed no interest in making music a career in her teens and twenties; however, when her marriage broke up in 1992, Griffin, now living in Boston, developed a keener interest in writing songs, and was soon performing regularly at local coffee houses. A&R people from A&M Records were impressed with Griffin's songs and soulful performing style, and she was signed to a record deal; early attempts to capture her sound in the studio didn't quite click, so her 1996 debut album, Living with Ghosts, was drawn from Griffin's original acoustic demo recordings. The 1998 follow-up, Flaming Red, teamed Griffin with a full band and a full-bodied production in sharp contrast to the spare sound of the debut. Griffin recorded an album in 2000 with producer Daniel Lanois called Silver Bell, but before it could be released, A&M was taken over by Universal in a corporate merger, and the album was put on the shelf while Griffin was left in limbo. Eventually, Griffin was released from her A&M contract. She signed with ATO Records, the artist-friendly label founded by Dave Matthews, and ATO released 1000 Kisses in 2002. In 2003, Griffin released a live album, A Kiss in Time, and by this point she was gaining greater recognition as a performer, with her songs being recorded by Willie Nelson, the Dixie Chicks, Bette Midler, and Emmylou Harris, while Shawn Colvin, Miranda Lambert, Solomon Burke, and the Wreckers would follow suit over the next several years. After releasing 2004's Impossible Dream, Griffin took three years off from the studio before returning with 2007's Children Running Through, which was named the year's best album by the Americana Music Association. In 2010 Griffin and her friend and collaborator Buddy Miller set up shop in Nashville's Downtown Presbyterian Church to record Downtown Church, a set of spiritually themed numbers, which won a Grammy for Best Traditional Gospel Album. That same year, Griffin took part in the recording sessions for Robert Plant's album Band of Joy, and she joined Plant's road band for the subsequent concert tour; Griffin also became the belated subject of music business gossip when she and Plant entered into a love affair that found the former Led Zeppelin singer briefly relocating to Austin, Texas, where she'd been living since the late '90s. By 2013, Griffin and Plant had gracefully parted ways, and she released the primarily acoustic set American Kid, a joint release between Columbia and New West Records. Also in 2013, Griffin's unreleased album Silver Bell finally received an official release (though the album had been circulating among fans for years), and her song "We Are Water" was performed by Hayden Panettiere on the hit TV series Nashville. In 2015 Griffin launched her own label, PGM, distributed by Thirty Tigers, and inaugurated the imprint with a new album, Servant of Love. Griffin's second PGM release, simply titled Patty Griffin, was issued in 2019.